Landmark Park Slope, the Naftali Group’s new Brooklyn luxury rental tower designed by Karl Fischer, is already half leased and residents are moving in, The Real Deal has learned exclusively. The 104-unit building, at 267 Sixth Street, had 800 potential tenants on its waiting list when Landmark Park Slope began leasing began Aug. 9 and more than 100 appointments in the first three days, said David Maundrell of aptsandlofts.com, which is handling the leasing and marketing. Monthly rents start at $2,150 for a studio, $2,500 for a one-bedroom and $3,800 for a two-bedroom. 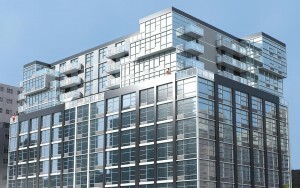 Seven penthouses range from $3,200 to $5,100 a month, Maundrell said. Apartments include floor-to-ceiling windows and white oak hardwood floors; building amenities include a concierge service, a media lounge with wet bar and a roof deck overlooking Manhattan with private cabanas. The 12-story high-rise is one of three buildings that Fischer has designed of late. He also has buildings in the works at 427 East 12th Street in Manhattan’s East Village and Brooklyn’s 23 Bleecker Street in Bushwick, as previously reported.